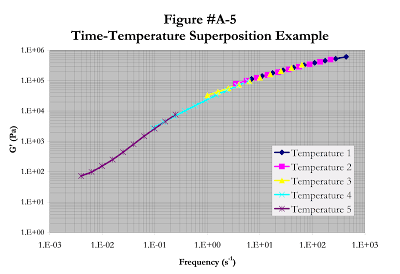 This page provides only a brief overview of the theory behind rheological characterization through dynamic mechanical analysis (DMA). To do this subject properly, you would need to write a whole book and that has in fact been done by multiple individuals, such as texts written by J.D. Ferry, Viscoelastic Properties of Polymers or the one by J. Dealy and K. Wissbrun, Melt Rheology and its Role in Plastics Processing. Polymeric materials nearly always exhibit deformation characteristics that are a combination of both solids (elasticity) and liquids (viscosity). Such materials are appropriately called viscoelastic. Determining the degree of elasticity and viscosity in a material is best done with a non-steady deformation, of which an oscillating shear is the most commonly applied example. A circular piece of material is placed between two circular plates and the lower plate is then sinusoidally oscillated about its axis at a fixed frequency and a fixed strain rate. The upper plate is attached to a torsional strain-measuring device, which measures both the strain as well as the phase difference between the upper and lower plates. If the material between the plates is a perfect solid, the upper plate would move in perfect unison with the lower driving plate. While this is intuitively obvious, it can also be shown mathematically as follows: The force F, exerted by an elastic solid is proportional to the displacement γ, that is, F = K γ, where K is the Hookean constant. For a sinusoidal displacement, γ = γ0 sin (ωt) so that F = F0 sin(ωt), where ω is the frequency and t is the time. If the material between the plates is a perfect fluid, the upper plate movement would be offset from the lower plate by 90 degrees. This is not nearly as intuitive as the solid example, but can be seen by the following argument: The force F, exerted by a perfect fluid is proportional to the rate of deformation, that is, F = η dγ/dt, where η is the Newtonian viscosity and dγ/dt is the deformation rate. For a sinusoidal displacement, γ = γ0 sin (ωt), so that dγ/dt = γ0 cos (ωt), and thereby F = F0 cos(ωt). Hence, the deformation oscillations at the upper plate for a viscous fluid precede the imposed deformation by 90 degrees. Viscoelastic materials will show a phase difference that is somewhere in the range of 0 to 90 degrees. In this case, the observed force will have the characteristic F = F0 sin(ωt + δ), where δ is the phase difference. This expression can be expanded and manipulated to arrive at F = F0cos(δ)•sin(ωt) + F0sin(δ)•cos(ωt). Since the phase difference is a constant, the first term is in phase with the applied deformation and the second term is 90 degrees out of phase with the applied deformation. In other words, the first terms is related to the solid behavior of the material while the second term is related to the liquid behavior of the fluid. The output of stress-strain measurements is commonly made in regards to the modulus of the material, which is found by dividing the force by the strain. The result gives the the complex modulus of the material, G* = G’ • sin(ωt) + G” • cos(ωt). G’ is the elastic or storage modulus and G” is the viscous or loss modulus. The values of these two moduli can be used to discuss the relative solid-liquid behavior of a material. If G’ > G”, than the material is more solid than liquid. The converse is also true. The complex viscosity can be found by dividing the modulus by the deformation frequency, namely, η* = G*/ω. While engineers are comfortable in working with viscosity as a characteristic of a material, it can be seen that it is less informative than working with the two moduli, G’ and G”. Not only are the moduli more fundamental properties (i.e., the viscosity can be found from the moduli, not the converse is not possible), but viscosity is seen as only a single curve or value, while the moduli are seen at two independent curves or values. A common output of DMA rheology is tan (δ) = G"/G', called the loss tangent. So far we have worked with 7 variables: G', G", G*, η*, ω, δ and t, but that is only the beginning. The inverse of G* is the complex compliance, J* = 1/G*, and just like with the complex modulus, the complex compliance can be broken into a storage compliance J' and a loss compliance, J". The relationship be G' and J' is a little complicated however: J' = (1/G')/(1 - tan2δ). Similarly, J" = (1/G")/(1 - tan2δ)-1. So that is 3 more variables. And then the complex viscosity η* can be broken into an in-phase component η' and an out-of-phase component η", but this is also a little tricky in that η' = G"/ω and η" = G'/ω (yes, the "prime" and "double prime" superscripts are crossed). So now we have a total of 10 outputs from one measurement. But this is only for shear stresses. We can also repeat these measurements in extensional flow too for another 10 more variables. And we can also work with steady-state deformations as well too and... I'll just stop with that. Read the books if you want more. At this point however, we are able to see why DMA is so much more powerful than a capillary viscometry test for example, and that is through the use of time-temperature superposition. Due to the mechanical constraints inherent in the dynamic mechanical spectrometer (as well as any other rheometric equipment), it is only able to explore a limited range of shear rates. However, the technique of “time-temperature superposition” allows frequency sweep data from different temperatures to be used in such a manner that a wider range of shear rates can still be explored than is directly possible by direct measurement. This is best seen by example. Figure A-1 below shows a plot of the storage modulus-frequency sweeps at five different temperatures. 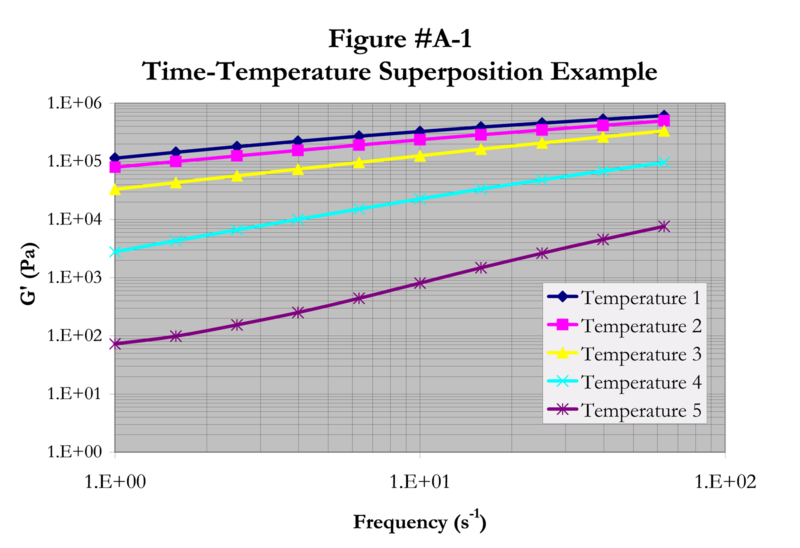 For this illustration, the middle temperature will be chosen as the reference temperature. Figure A-2 shows the same data, except that one of the frequency sweeps at a temperature higher than the reference temperature has been shifted horizontally to lower frequencies until it made contact with the reference. Figure A-3 shows the next step: that the highest temperature frequency sweep has been shifted to even lower frequencies. Figure A-4 shows that the frequency sweep at the temperature just below the reference temperature has been shifted to higher frequencies. Lastly, Figure A-5 show the final master curve which is formed after all the frequency sweeps have been shifted. It can be seen that while the original measurements were made only over the shear-rate range of 1 s-1 and 75 s-1, the final curve covers the range of 4 x 10-2 s-1 to 500 s-1. It must be noted that there is a strong theoretical basis for making these shifts – they are not simply undertaken because of their visual appeal. The basis is described in the references noted above and not described here. The technique has been used for over 60 years with great success in a vast range of polymers. I have one last point to make: The question arises as to how the shear rate frequency can be related to the shear rate that is observed in most real world situations. A couple of researchers gave us the Cox-Merz rule: If ω = then η*(ω) = η( ) Why this works, no one really knows, and more importantly, it doesn't always work either. With standard linear polymers (pretty much any commercially available polymer that I've run across) it works fine, but if you start adding fillers, reinforcing agents or other additives, you might start running into problems. You won't know until you check however, but you are now forewarned - the Cox-Marx rule is an observation that holds true in many, but not all cases. Thank you very much for this clear and coherent explanation.